A combination of these words have been uttered to me by friends, relatives, new acquaintances and even strangers via email, more times than I can count. So many people seem to have this romanticized version of what being an entrepreneur consists of. They’re bombarded with social media humble-brags of people working from the beach -- they read articles about newly minted billionaires -- and don’t even get me started on TV. But, being an entrepreneur can also be incredibly liberating, exhilarating and unbelievably rewarding. Now here’s the thing. Most of the time, it’s all of these things (and so many more) at the same time and often all on the same day. This simple image was created by Derek Halpern (who runs Social Triggers and Zippy Courses) and it’s been shared thousands and thousands of times because…well…it rings true with entrepreneurs who know that, while there are definitely ups when running your own business, there’s also a lot of downs. From failure to million-dollar business. Derek understands how difficult it can be as an entrepreneur because he didn’t just rise to success on a linear path. In fact, it was quite the opposite, as he points to the critical role that failure played in building a million-dollar business. Halpern started his first blog after accidentally clicking on someone else’s site and realizing he could get paid by advertisers. He figured this would be an easy way to make money. He was wrong. It bombed. Then he accidentally clicked on another blog and decided he’d try again…this time “making fun of celebrities” instead of sharing the dumb things he did in college. He was right. It worked. He was starting to climb the ladder of success that everyone dreams of. And while he was suddenly doing better than he’d ever had, he still struggled from time to time, like when he decided to run his blog and hold a corporate job, which went great until he got a mediocre review, starting a downward spiral of hating himself and “drinking too much.” Or when he decided to launch a website for conferences and speakers, working on it for months before realizing that others were doing the same -- and failing.. The point is this: Being an entrepreneur is all about experiencing these ups and downs -- both daily and over time -- but it also involves learning how to navigate them so you still attain success in the end. The problem with this harmful myth. I’ve been fortunate enough to meet a handful of actors, entrepreneurs, and artists who were “overnight successes”. Each of these people only had one thing in common -- none of them were actually overnight successes. As, Carolyn Gregoire points out, the road to success is usually a marathon and not a sprint…but it doesn’t always seem that way. Most people don’t magically float their way to the top. To make matters worse, some of the “instant-success” stories we use as our sources of hope and inspiration are false…as in the case of "Angry Birds," an app that was allegedly an “overnight success” but actually took 51 attempts before the developer, Rovio, could make it work. So while it’s nice to think of yourself taking an easy escalator to the pinnacle of achievement, losing this expectation right up front can actually save you a lot of frustration when you encounter obstacles in your way that threaten to halt your ascent. Sure…some people have been lucky and went from having nothing to having everything in the blink of an eye. But those times are so few and far between that, if you’re hoping that’s what happens to you, then you’d sooner win the lottery while getting struck by lightning. In a 2015 interview with Halpern, Tim Ferriss, author of “The 4-Hour Workweek” shared how, at one point, he was so down that he actually considered suicide. Fortunately he didn’t, and he learned something very important from that time in his life: neither ups nor downs are permanent. In other words, when you’re up, enjoy it because it’s not going to last forever. Soak it in, revel in it, bask in its glory. And if you’re down, remember that relief is ahead because you can’t stay down forever either. This is critical because entrepreneurship and depression oftentimes go hand in hand. Brush up on your stoicism. Another way to survive your downs is to brush up on your stoicism. What does that mean? This involves realizing that, while you can’t always dictate what happens in your world, it is up to you how you respond. You have the power to let your circumstances sink you or you can choose to use them in a way that helps you rise instead. Has someone slammed a door in your face? Look around for a window. In a tough spot with your business and not sure how to progress? Ask another successful entrepreneur for advice. You may feel like you’ve been dealt a rotten hand, but you can still outscore your opponent if you play cards better. Surviving amid the ups and downs. 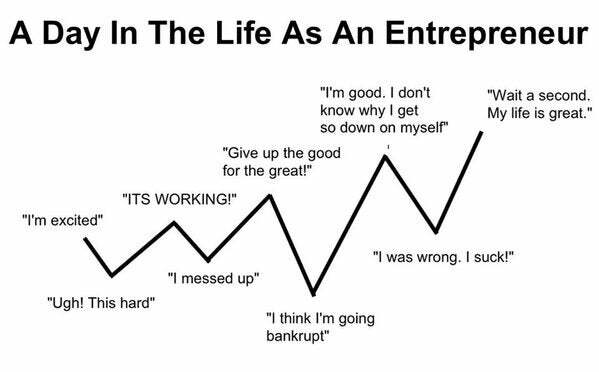 Yes…living the life of an entrepreneur has many, many ups and downs. Sharing your ups with others can help take you even higher. Do these four things and you’ll be on a steady climb upward, even though you’ll still have to deal with a few “bumps” along the way.